Last summer, I was introduced to the world of hobby robotics and began building an obstacle-avoidance bot as a way to learn the basics. Once classes started last September, all projects were set aside until I graduated, allowing me to focus on school. Now that I have free time, I’ve been thinking about what kind of robot to build next. 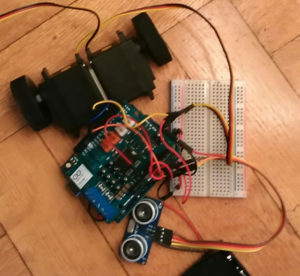 It will probably still have wheels and an ultrasonic sensor, but I want it to behave based on its internal environment as well as its external environment. Not only will it detect objects in its path, but it will also move about based on its mood or current emotional state. For example, if it were to be afraid of loud noises, it would go to “hide” against a nearby object. This specific functionality would require the robot have a microphone to detect sounds, and is something I have been thinking of adding. Otherwise, the only input the robot has is object-detection, and producing or calculating emotions based on the frequency of things in its path is kind of boring. I have also been interested in operationalizing, codifying, and programming emotions for quite a while now, and this project would be a great place to start. One helpful theory I came across is the Three-Factor Theory (3FT) developed by Mehrabian and Russell in 1974 (Russell and Mehrabian 274). It describes emotions as ranging through a three-dimensional space consisting of values for pleasure, arousal, and dominance. For example, a state of anger is associated with -.68 for pleasure, +.22 for arousal, and +.10 for dominance (Russell and Mehrabian 277). After mulling on these averages for a second, I feel these are fairly reflective of general human nature, but let’s not forget these values are dependent on personality and contextual factors too. However, the notion of ‘dominance’ doesn’t feel quite right, and I wonder if a better paradigm could take its place. Personally, the idea of being dominant or submissive is quite similar to the approach/avoidance dichotomy used in areas of biology and psychology. ‘Dominance’ is inherently tied to social situations, and a broader theory of emotion must account for non-social circumstances as well. The compelling argument from the approach/avoidance model centers around hedonism, motivation, and goal acquisition; if a stimulus is pleasurable or beneficial, individuals are motivated to seek it out, while undesirable or dangerous stimuli are avoided in order to protect oneself (Elliot 171). Furthermore, this also works well with the Appraisal Theory of emotion, as it argues that affective states indicate an individual’s needs or goals (Scherer 638). Therefore, I will be using a value range based on approach/avoidance rather than dominance. While human emotions tend to involve much more than a simple judgement about a situation, the Appraisal Theory should suffice for a basic robot. One last modification I would like to make in my version of the 3FT is changing ‘pleasure’ to ‘valence’. This is merely to reflect the style of language used in current psychological literature, where positive values are associated with pleasure and negative values are associated with displeasure. I also like this because robots don’t feel pleasure (yet?) but they are capable of responding based on “good” and “bad” types of stimuli. ‘Arousal’ is perfectly fine as it is, as it reflects how energetic or excited the individual is. For example, being startled results in high arousal due to the relationship between the amygdala, hypothalamus, and other local and distal regions in the body, which typically prepare the individual to run or fight (Pinel 453-454). To summarize, the three factors I will be using are valence, arousal, and approach/avoidance. As much as I would love to find a term to replace ‘approach/avoidance’, for the sake of a nice acronym, I have yet to find one which encapsulates the true nature of the phenomenon. Anyway, this modified 3FT seems to be a good start for developing emotional states in a simple robot, especially if it only receives a narrow range of sensory input and does not perform any other sophisticated behaviours. While this robot will possess internal states, it won’t be able to reflect upon them nor have any degree of control over them. Heck, I won’t even be using any type of AI algorithms in this version. So if anyone is spooked by a robot who feels, just know that it won’t be able to take over the world. Elliot, Andrew J. “Approach and avoidance motivation and achievement goals.” Educational psychologist 34.3 (1999): 169-189. Pinel, John PJ. Biopsychology. Boston, MA: Pearson, 2011. Russell, James A., and Albert Mehrabian. “Evidence for a three-factor theory of emotions.” Journal of research in Personality 11.3 (1977): 273-294. Scherer, Klaus R. “Appraisal theory.” Handbook of cognition and emotion (1999): 637-663.